Unfortunately, it's one of those accidents whose appearance usually belies the scope of the cleanup effort. 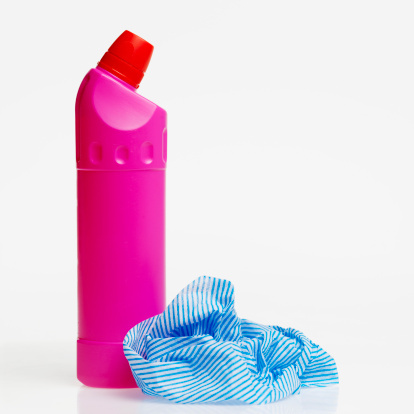 Whether you've spilled a little liquid laundry detergent on a hard surface, such as linoleum or concrete, or on carpet, the detergent is concentrated. A little goes a long way. That's the extent of the bad news. The good news is that you should begin by containing the spill and soaking up as much of the liquid detergent as possible with a truly powerhouse absorbent that might surprise you: kitty litter. Cover the detergent spill with a thick layer of kitty litter. Wait until the detergent is absorbed. The more detergent you've spilled, the longer it will take for the litter to absorb the sticky soap. Leave it and check back occasionally. Block off your work area with a string barricade, or at least restrict foot traffic around it, while you work. Place towels around the perimeter of the spill to keep it from spreading. Some laundry detergent is bound to seep, and it's very slippery on hard surfaces. Scoop up the wet litter with paper towels, old newspapers or other paper you can easily throw away. Fill a bucket with cool water and remove soapy residue with a sponge. Cool water produces fewer suds than warm or hot water. Here is where a little patience may be required; depending on the size of the spill, you might have to change the water frequently until all the soap is removed. Let the floor air-dry, or wipe it with a clean cloth. Run your hand over it to ensure that no sticky residue remains. Pour a thick layer of kitty litter over the detergent spill. Let the litter absorb the detergent fully. Scoop up the kitty litter and detergent with paper towels and throw them away. Alternatively, use a small broom and dustpan. Cover the spill area with paper towels or old rags, and press down on them to absorb any remaining detergent. Spray the spill area with water from a spray bottle until the carpet is thoroughly damp. Remove the water with a shop vac or carpet cleaner, working slowly over the spill area. Repeat the process as necessary until no bubbles form on your carpet and the carpet feels restored to its original condition.